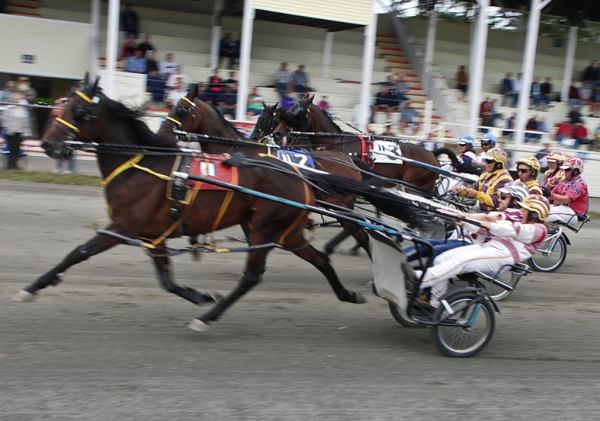 Four Maine state senators participated in a harness race at the fairgrounds during the 175th Farmington Fair on Tuesday. Nearest team pulling ahead to a first place finish is Sen. Garrett Mason, driver Charlene Cushing and horse Shady Touch. Maine Senate Majority Leader Garrett Mason, R-Androscoggin gives a thumbs up after the first place finish. Driver Charlene Cushing and horse Shady Touch helped with the win. 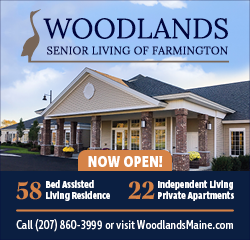 FARMINGTON - Nearing the finish line, four Maine state senators were locked in a neck-and-neck race Tuesday afternoon. In a pari-mutuel race like no other, the senators were all decked out in racing silks to match their drivers' colors. A courtesy ride-by the grandstands before the race got the crowd whooping and applauding and probably wondering what was going on. The announcer explained it all and the horses took off and ran the race evenly. Coming in first after rounding the track twice was Senate Majority Leader Garrett Mason, R-Androscoggin. 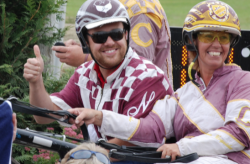 Driver Charlene Cushing had a little something to do with Mason's success, as did race horse Shady Touch. In the winners circle, Mason noted Cushing's skill and how fun racing is, both as a rider and as a spectator. Coming is second place was state Sen. Tom Saviello, R-Franklin, with driver Steven Wilson and their horse, A Place Out West. Sen. David Woodsome, R-York, driver Philip Bosowers and horse Malek Hanover, took third, just edging out state Sen. Linda Baker, R-Sagadahoc, driver Battista Negri and horse, Snuff Box. The race was held before an appreciative crowd at the fairgrounds track during the third day of the week-long 175th Farmington Fair. It was Saviello of Wilton, who thought up the idea and coordinated it with Cushing Stables of Farmington. Saviello serves on the Agriculture, Conservation, and Forestry Committee and wanted to highlight the tradition of harness racing. “I thought this would be an excellent way for my colleagues and I to get an up close and personal experience with one of Maine’s most storied agricultural traditions,” he said. “Harness racing is a key part of our many agricultural fairs, is an economic boon for the state, and is also extremely fun to watch." The Farmington Fair continues through Saturday, Sept. 26. See the complete schedule and highlights here. 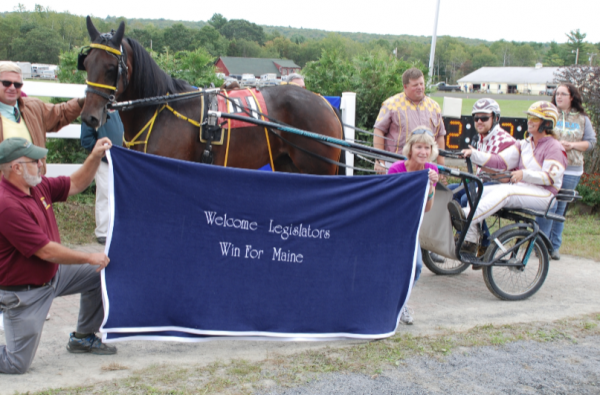 In the winners circle: Maine Sen. Garrett Mason, driver Charlene Cushing and race horse Shady Touch.